On the 1st of May, a young grey squirrel was brought to me that had been caught by a dog and used as a chew toy. The poor little girl was not injured, but also frozen stiff with fear. It was soon obvious her wounds were serious. After a quick trip to the vet, we brought her home to see what we could do for her. She was old enough to be eating solid food and running around, but she could not chew with her swollen face, nor walk at all. When she did move, she could only drag around with her 2 working legs. there was also a herniated cut on her belly. Although it appeared she would not make it, we worked on her the first week with syringe fed foods like apple sauce and baby food, while encouraging her to keep moving around. She seemed very determined to get better, eating like a pig even with the painful mouth and trying to walk continuously. At the end of the first week, she started eating on her own and hobbling around on her own 3 good legs with one front leg still held up. It was like opening a door for her. She ate and hobbled restlessly until the last leg finally got going. She is now a normal healthy squirrel running around in the trees! 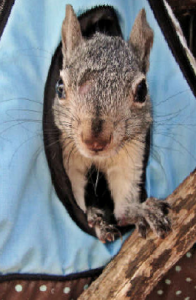 We normally don’t have names or special stories about squirrels, but this one that we called “Chew-Toy” is very special, and defines our motto of giving the wildlife a second chance.